Born about 1728, Margaret Schaad was my paternal 5th great grandmother. I've also seen her name as Margareta Schad and Margretha Schad. She was baptized on June 13, 1728, in Weinfelden, Thurgau, Switzerland. Her parents were Hans Joachim Schad and Eva Reidtbergerin. Her siblings I've found through the baptismal records on ancestry.com were Solomon (1714-1723), Anna (b. 1716), Jacob (1718-1720), Maria (b. 1720), Solomon (1723-1768), Hans Joachim Jr. (b. 1725), and Regula (1728-1728). Regula was baptized the same day as Margaret. There appears to have been another daughter named Margaretha who was baptized in 1724. I haven't found a burial record index for her and I've not seen the original records for any of the children. 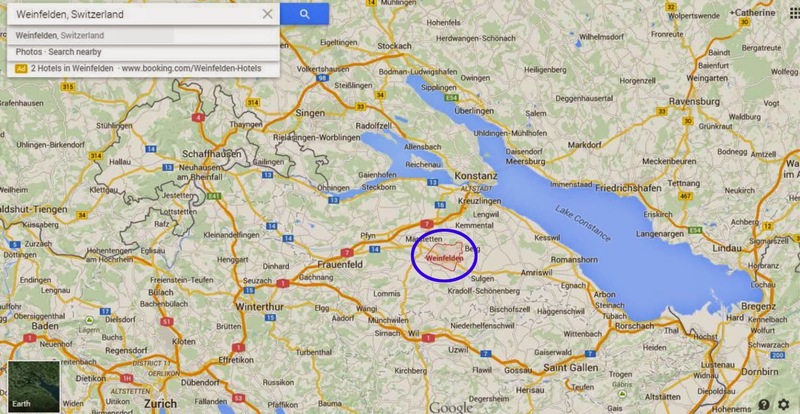 Weinfelden, Thurgau, Switzerland is circled in blue (from Google maps). Margaret was about 13 years old when she came to America with her parents and her siblings Anna, Hans, and Solomon. They sailed from Switzerland on the ship Europa and arrived on the coast of Georgia on December 4, 1741. Her father received a grant in 1742 for 50 acres of land in Vernonburg, Georgia, on the Vernon River about 10 miles south of Savannah. [3,4] The settlement was laid out in 1741, and the first settlers were indentured servants. They grew flax and cotton for cloth, but producing silk was much less successful. Life here was hard, and many of the early settlers abandoned their land and moved to Savannah and Augusta, Georgia. At the age of 24, Margaret married Frederic Edmund Treutlin in 1752. She gave birth to at least three children: Ann Margaret (1754-1824), Catherine (1756-1836, my 4th great grandmother), and Elizabeth (1758-1759). Frederic died in 1798. Margaret lived another nine years and died on July 23, 1807, at the age of 79. Ancestry.com. Switzerland, Select Baptisms, 1491-1940. Baptismal records for the children of Hans Joachim Schad and Eva Reidtbergerin. Database online; Switzerland Select Burials, 1613-1875. Death dates for Solomon (the first), Jacob, and Regula Schad. Ancestry.com. U.S. and Canada, Passenger and Immigration Lists Index, 1500s-1900s. Hans Joachim, Eva, Hans, Margareta, and Solomon. Database online. George F. Jones. The Germans of Colonial Georgia 1733-1783. (Genealogical Publishing Company, Inc., Baltimore, 1986, xiii, 97); Allen D. Chandler. The Colonial Records of Georgia. Vol. I. (The Franklin Printing and Publishing Company, 1904, p. 405). Georgia Department of Transportation. Vernonburg Georgia. Electronic document, http://www.dot.ga.gov/Projects/programs/environment/resources/outreach/Documents/Publications/Vernonburg-GA-Booklet.pdf, accessed December 15, 2014.